Hello all, over the weekend I made this recipe with Quorn Burgers, a product we eat quite a lot of but with no variations whatsoever. We really like Quorn burgers in all their varieties, in particular the sweet pepper and red onion ones are very nice, perfect for barbeques in the summer and jazzed up in a bun with cheese, ketchup and maybe some onions. I was intrigued therefore, by this recipe which does something quite different with them. 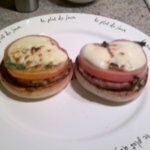 Basically you split an English muffin in half and use each half as a base for your 'pizza', you then toast it lightly before spreading it with pesto and topping with a (pre-cooked) burger - I used normal, plain frozen ones for this recipe, a slice of beef tomato, some basil and mozzarella cheese and then grilling until the cheese melts and bubbles. Simples as the meerkat would say. Simple - yes , but delicious! This is such a lovely way to eat the burgers and works really well, its also quick. I cooked my burgers in the microwave while I toasted the muffins - this has the added benefit of using no fat to cook them and meant that the grill was still hot when I needed to put them back under. I used lower fat mozzarella to keep the points values down and do not think you can tell the difference. In terms of points values, the recipe serves 2 with a portion being 2 burgers each. This is quite substantial and I would probably serve it with a salad or something for a lighter option. Each portion of 2 burgers is 11 propoints broken down as follows: burgers (4), muffin (4), pesto (2), mozzarella (1). Obviously if you use full fat mozzarella the value will be higher and you could probably shave it down a little using low fat pesto. My husband absolutely loved these and actually made himself another two once he had finished his own (he does run marathons so can annoyingly get away with putting away a lot of food!). Both of us thoroughly enjoyed this recipe and it is definitely one I will make again. We gave it a 9/10 for innovativity and being so enjoyable - nice one Quorn for giving me something different to do with quorn burgers! 2011 - A New Year and A Bonus Recipe!